Toyota Corolla is one car that is never going out of fashion. The moment this car rolls on the road, it spells nothing less than extraordinary design, elegance, beauty and comfort. But, Toyota is in no mood of letting things settle here. Another big combo blow to the competitors of this car is its availability in a new color, Deep Blue Metallic. 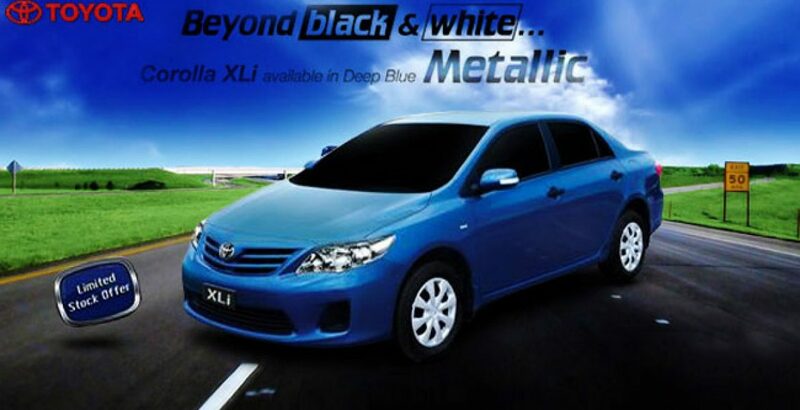 Previous model Toyota Corolla Xli 2012 was only available in white and black colors, but now, with new colors adding to its shade card, it is expected to make more sales then before. The demand of luxury cars in Pakistan is increasing every day, making car manufacturers think of more ways to entertain and retain customer loyalty. One good feature that comes as a big change from previous years is the delivery of cars right from the showroom. This is to make sure that in case you do fall in love with your corolla, you do not have to wait for it. All you have to do is to pay the price and the new Toyota Corolla Xli in Deep Blue Metallic body colors is yours to drive home. Apart from the body color, there are no changes inside the car. The interior is all classic with spacious interior, use of premium materials and technology. However, being Xli, you might have to add a few things here and there in the car to make it look hot and custom made for you. That also is not a problem, because the guys at the showroom will be more than happy to show you the options you can take and the price tag that comes with. Still, Toyota has intelligently placed its new color for Corolla Xli at times when almost every other carmakers were trying hard to come around with new models. With Toyota Corolla Xli 2013 on the roads in new color, it is not wrong to say that Deep Blue Metallic is the new Red Hot.